Traditional or paper pieced, this quilt is extraordinaire. Start at the beginning and finish a quilt that no one will ever believe was your first quilt. What an inspiration this Kaffe Fassett quilt design is to show off your favorite fabrics. Make darling little flower pots. Let Nancy show you how to make this stunning quilt. 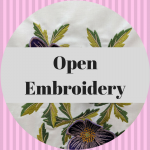 Calling all embroiderers or those that want to embroider! This is a hands-on workshop featuring Anita Goodesign. Are you having trouble working on an embroidery project? Do you have problems with stabilizers? Join us for a time of hand stitching. 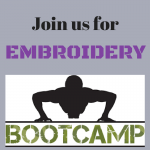 We have set aside a whole day for you to come in and work on your embroidery projects. Let's embroider on something different each month. Learn placement, stabilizer and design techniques. Learn all about needlepoint during a trunk show with Abby Cecile a local needlepoint designer. Join our staff and SVP Elite Educator, Christine Harlan, for a fun and inspiring all day event on the Fabulous Pfaff Creative Icon. HE"S BAAAACK!!! Exclusive Giucy quilt! Prepare yourself to have SO much fun in this class and to receive a lot of compliments every time you use this amazing cartonnage fabric wallet. Have you experimented with English Paper Piecing and are looking for a fun new project? Would you like to learn to sew? This class will teach you basic sewing skills. Come put your creative juices to the test! It's time to learn your software! Each month we will be working with different modules within the program.